Marriott has finally got around to launching 29 Ways to Stay contest where you can win instant prizes of points and stays. It is on the main landing page of the contest where Marriott explains that they have added more to their current MegaBonus promotion. 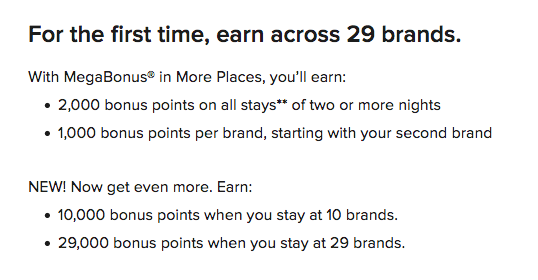 The new portion of the MegaBonus Promotion will award members an additional 10,000 bonus points if they stay at 10 of Marriott/SPG/Ritz brands and 29,000 bonus points if they stay at all 29 brands. Note that you won't find this new addition to the promotion on the main MegaBonus registration page.